Have I mentioned I have a wonderful husband? Last week he came home from work, took the cranky baby out of my arms and told me to go in my sewing room, lock the door, and have “mommy quiet time”, while he proceeded to feed the kids dinner, bathe them, and get them all in bed. I think he could tell I was teetering on the edge of crazy…which was true. So I stuck my headphones in and started a new quilt. I forgot how much I love this pattern/tutorial I made 4 years ago. It uses fat quarters or 1/4 yards, and goes together so quick. I stacked all of my fat quarters and cut this out super fast, and had all of my blocks pieced in no time for a throw size. The floral print by Leah Duncan is amazingly beautiful! It goes with so much of the fabric I already have, so it was really fun to pull fabrics for this quilt from all different lines. How nice to get a little creative time for yourself. That can do wonders for you! The top looks great. Oh I love this story, LOVE awesome husbands who can deal with cranky babies and I LOVE this quilt! I still have that tutorial printed out from 4 years ago and the matching bundle of Seaside ready to go! Can’t rush these things, right? :) Also, yay to sewing time. Lol! At least the fabric is pretty to look at right? You should have him cloned! He’s priceless & so wonderful that he’s appreciated! 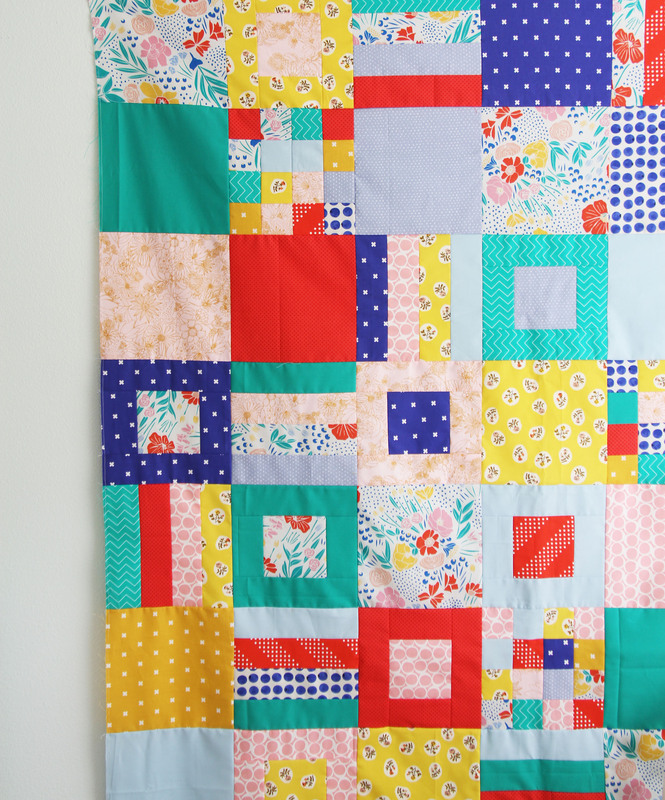 Love this quilt and all the different blocks in it. Yes, sewing ‘quiet time’ makes me a happier person too. We all need that – so glad you had that break. what a nice hubby you have! I am glad you got some time to yourself…I think in order to be a good mom we all need some alone time once in a while. How wonderful and perceptive of your husband. I love the quilt. I remember seeing the tutorial before but love it even more in this version. I will be making one soon! It’s funny–I was excited that it uses a lot of fat quarters. I remember in the past being excited when one of your quilts did NOT use many. I think I ‘ve been shopping a lot since then! Lol you know you have a fat quarter problem when you need a way to use them! ;) I have the same problem! Aww that is so great! Just wow! What a guy! How neat that he realized exactly what you needed. Yay for fantastic hubbies and new quilt tops! What a wonderful hubby! 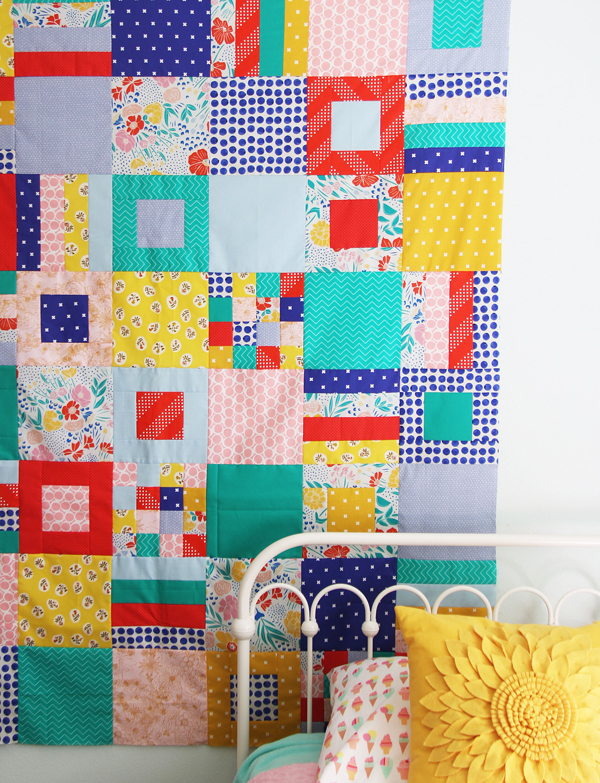 I love the quilt – I may have to make one myself! I like those fabrics you’ve put together — I’ve gotten kinda hung up on that yellow Tiger Lily print and not knowing what else it could go with! 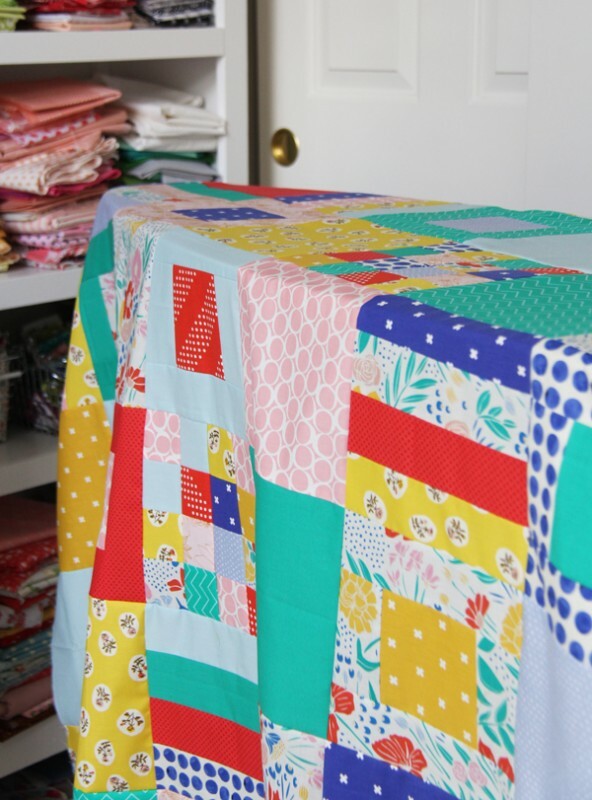 And that’s a favorite pattern of mine — I’m thinking about making a big scrappy mess of a picnic quilt using your tutorial with long strings and short strings, big squares and little. i like to think that my “on the brink” doesn’t show, but my spouse claims that I’m pretty transparent. Good for your hubby. Love the quilt–one I’d love to make. Wow, I absolutely love the fabrics you put together! The blueberry print from C & S looks absolutely fantastic in this context. And the Dottie Stripe looks so good as a frame. Clearly your spirit came through! What a dear sweet hubby! Tell him thanks from a subscriber! :) And I love the color choices! (I love bright colors.) Thanks for sharing. Oh I love this! Colors/fabrics and pattern! Inspired to do this soon!! Now, that is a wonderful husband! Thanks for sharing this lovely quilt and thank him too, (from us) since you can share your inspiration with us while he is helping with the kids! Allison. The cutting diagram download is not working. Is there a way to get this? Is it needed,to make this pattern? This is beautiful! I love the design and the fabric is so much fun!! what a sweet guy! Us mommies need a break now and then… I often say that I am outnumbered on a good day (we have 4) in our house :) but I love them to bits–but we all need a break. That was sweet, love your patterns. This is such a cute quilt. These aren’t fabrics I’m normally drawn to but perhaps I need to rethink. You totally drew me in with your scrappy houndstooth (mine is waiting for space on the design wall but all the “tooth” blocks are made). Yes, I need to rethink what I’m adding to my stash.